Yeovil Country Park was established in 2002 and includes a variety of landscape types and habitats. It is a very popular resource for the adjacent population of Yeovil providing a vital greenspace to the south and east of the town. 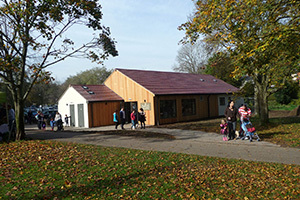 H&L were appointed by South Somerset District Council (SSDC) in 2012 to assist with the development of a project to provide a new centre in the Park for visitors, volunteers and staff and also to provide greater resources for community engagement and habitat improvements. Following discussions with the HLF it was decided to split the project into the new building (the Green Hub), and the community engagement, practical work and new interpretation. HLF indicated their preference for the latter project so work began on securing the funding for the new centre. With initial match funding from SSDC major project funding was secured from the Veolia Environmental Trust with SSDC staff, Friends of the Country Park and the consultants working together to secure the remaining funding. The new Ninesprings – café, interpretation and education centre opened in October 2014. Running in parallel was a round 1 Heritage Grants application to HLF. A round 1 pass was secured in June 2013 with the round 2 development stage commencing in March 2014. In April 2014 H&L were appointed to provide assistance with the development of the round 2 bid working with Yeovil Country Park staff, a V3 Project Development Officer and the project team. The project secured an HLF round 2 pass in June 2015 with a grant of £251,200 awarded.